For other people named Celsus, see Celsus (disambiguation). Celsus (/ˈkɛlsəs/; Greek: Κέλσος. 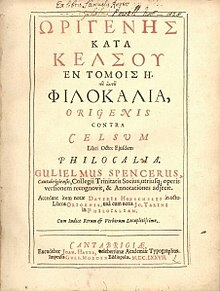 Kélsos) was a 2nd-century Greek philosopher and opponent of early Christianity. He is known for his literary work, On The True Doctrine (or Discourse, Account, Word; Greek: Λόγος Ἀληθής, Logos Alēthēs), which survives exclusively in quotations from it in Contra Celsum, a refutation written in 248 by Origen of Alexandria. On The True Doctrine is the earliest known comprehensive criticism of Christianity. It was written c. 175 to 177, shortly after the death of Justin Martyr (who was possibly the first Christian apologist), and was probably a response to his work. Celsus was the author of a work titled On The True Doctrine (Logos Alēthēs). The book was suppressed by the growing Christian community, and banned in 448 CE by order of Valentinian III and Theodosius II, along with Porphyry's 15 books attacking the Christians, The Philosophy from Oracles, so no complete copies are extant, but it can be reconstructed from Origen's detailed account of it in his 8 volume refutation, which quotes Celsus extensively. Origen's work has survived and thereby preserved Celsus' work with it. Celsus seems to have been interested in Ancient Egyptian religion, and he seemed to know of Hellenistic Jewish logos-theology, both of which suggest The True Doctrine was composed in Alexandria. Celsus wrote at a time when Christianity was growing. Origen indicates that Celsus was an Epicurian living under the Emperor Hadrian; but Celsus’ arguments suggest rather he was an Eclectic and active during the reign of Marcus Aurelius. Celsus writes that "there is an ancient doctrine [archaios logos] which has existed from the beginning, which has always been maintained by the wisest nations and cities and wise men". He leaves Jews and Moses out of those he cites (Egyptians, Syrians, Indians, Persians, Odrysians, Samothracians, Eleusinians, Hyperboreans, Galactophagoi, Druids, and Getae), and instead blames Moses for the corruption of the ancient religion: "the goatherds and shepherds who followed Moses as their leader were deluded by clumsy deceits into thinking that there was only one God, [and] without any rational cause ... these goatherds and shepherds abandoned the worship of many gods". However, Celsus' harshest criticism was reserved for Christians, who "wall themselves off and break away from the rest of mankind". O light and truth! he distinctly declares, with his own voice, as ye yourselves have recorded, that there will come to you even others, employing miracles of a similar kind, who are wicked men, and sorcerers; and Satan. So that Jesus himself does not deny that these works at least are not at all divine, but are the acts of wicked men; and being compelled by the force of truth, he at the same time not only laid open the doings of others, but convicted himself of the same acts. Is it not, then, a miserable inference, to conclude from the same works that the one is God and the other sorcerers? Why ought the others, because of these acts, to be accounted wicked rather than this man, seeing they have him as their witness against himself? For he has himself acknowledged that these are not the works of a divine nature, but the inventions of certain deceivers, and of thoroughly wicked men. Origen wrote his refutation in 248. Sometimes quoting, sometimes paraphrasing, sometimes merely referring, Origen reproduces and replies to Celsus' arguments. Since accuracy was essential to his refutation of The True Doctrine, most scholars agree that Origen is a reliable source for what Celsus said. Classicist Arthur J. Droge has written that it is incorrect to refer to Celsus' perspective as polytheism. Instead, he was an "inclusive" or "qualitative" monotheist, as opposed to the Jewish "exclusive" or "quantitative" monotheism; historian Wouter Hanegraaff explains that "the former has room for a hierarchy of lower deities which do not detract from the ultimate unity of the One." Celsus shows himself familiar with the story of Jewish origins. [clarification needed] Conceding that Christians are not without success in business (infructuosi in negotiis), Celsus wants them to be good citizens, to retain their own belief but worship the emperors and join their fellow citizens in defending the empire. It is an earnest and striking appeal on behalf of unity and mutual toleration. One of Celsus' most bitter complaints is of the refusal of Christians to cooperate with civil society, and their contempt for local customs and the ancient religions. The Christians viewed these as idolatrous and inspired by evil spirits, whereas polytheists like Celsus thought of them as the works of the Daemons, or the god's ministers, who ruled mankind in his place to keep him from the pollution of mortality. Celsus attacks the Christians as feeding off faction and disunity, and accuses them of converting the vulgar and ignorant, while refusing to debate wise men. As for their opinions regarding their sacred mission and exclusive holiness, Celsus responds by deriding their insignificance, comparing them to a swarm of bats, or ants creeping out of their nest, or frogs holding a symposium round a swamp, or worms in conventicle in a corner of the mud. It is not known how many were Christians at the time of Celsus (the Jewish population of the empire may have been about 6.6-10% in a population of 60 million to quote one reference. Chisholm, Hugh, ed. (1911). "Celsus" . Encyclopædia Britannica (11th ed.). Cambridge University Press. ^ a b Ulrich R. Rohmer (15 January 2014). Ecce Homo: A collection of different views on Jesus. BookRix GmbH & Company KG. p. 98. ISBN 978-3-7309-7603-6. ^ Origen, Contra Celsum, preface 4. ^ Chadwick, H., Origen: Contra Celsum. CUP (1965), 3, 17, 19; 8, 58. He quotes an Egyptian musician named Dionysius in CC 6, 41. ^ Gottheil, Richard; Krauss, Samuel. "Celsus". Jewish Encyclopedia. Retrieved 2007-05-18. ^ Chadwick, H. Origen: Contra Celsum, introduction. ^ Hendrik van der Loos (1965). The Miracles of Jesus. Brill Publishers. Retrieved 14 June 2012. According to Celsus Jesus performed His miracles by sorcery (γοητεία); ditto in II, 14; II, 16; II, 44; II, 48; II, 49 (Celsus puts Jesus' miraculous signs on a par with those among men). ^ Philip Francis Esler (2000). The Early Christian World, Volume 2. Taylor & Francis. Retrieved 14 June 2012. To disprove the deity of Christ required an explanation of his miracles which were recorded in scripture. Celsus does not deny the fact of Jesus' miracles, but rather concentrates on the means by which they were performed. Perhaps influenced by rabbinical sources, Celsus attributes Jesus' miracles to his great skills as a magician. ^ Ernest Cushing Richardson, Bernhard Pick (1905). The Ante-Nicene fathers: translations of the writings of the fathers down to A.D. 325, Volume 4. Scribner's. Retrieved 14 June 2012. But Celsus, wishing to assimilate the miracles of Jesus to the works of human sorcery, says in express terms as follows: "O light and truth! he distinctly declares, with his own voice, as ye yourselves have recorded, that there will come to you even others, employing miracles of a similar kind, who are wicked men, and sorcerers; and Satan. So that Jesus himself does not deny that these works at least are not at all divine, but are the acts of wicked men; and being compelled by the force of truth, he at the same time not only laid open the doings of others, but convicted himself of the same acts. Is it not, then, a miserable inference, to conclude from the same works that the one is God and the other sorcerers? Why ought the others, because of these acts, to be accounted wicked rather than this man, seeing they have him as their witness against himself? For he has himself acknowledged that these are not the works of a divine nature, but the inventions of certain deceivers, and of thoroughly wicked men." ^ Origen (30 June 2004). Origen Against Celsus, Volume 2. Kessinger Publishing. Retrieved 14 June 2012. But Celsus, wishing to assimilate the miracles of Jesus to the works of human sorcery, says in express terms as follows: "O light and truth! he distinctly declares, with his own voice, as ye yourselves have recorded that there are as ye yourselves have recorded, that there will come to you even others, employing miracles of a similar kind, who are wicked men, and sorcerers; and he calls him who makes use of such devices, one Satan. So that Jesus himself does not deny that these works at least are not at all divine, but are the acts of wicked men; and being compelled by the force of truth, he at the same time not only laid open the doings of others, but convicted himself of the same acts. Is it not, then, a miserable inference, to conclude from the same works that the one is God and the other sorcerers? Why ought the others, because of these acts, to be accounted wicked rather than this man, seeing they have him as their witness against himself? For he has himself acknowledged that these are not the works of a divine nature; but the inventions of certain deceivers, and of thoroughly wicked men." ^ Martin, Dale B. (2004). Inventing Superstition: From the Hippocratics to the Christians. Cambridge, Massachusetts: Harvard University Press. pp. 141, 143. ISBN 0-674-01534-7. Nixey, Catherine (2017). The Darkening Age: The Christian Destruction of the Classical World. London, UK: Macmillan. ISBN 978-1-5098-1606-4. R. Joseph Hoffmann (1987). On the True Doctrine: A Discourse Against the Christians. Oxford University Press. ISBN 978-0-19-504151-4. "Celsus the Platonist" . Catholic Encyclopedia. 3. 1908. "Celsus" . Encyclopædia Britannica. 5 (11th ed.). 1911. "Celsus". The Jewish Encyclopedia. 1901–1906.